Arundel Gecko Fur handlebar tape sounds the stuff of pimped Lambretta, not everyday road bikes, but after a quick Quadrophenia moment I dressed another set of bars and found myself justly impressed by its tenacious grip and tactile nature come, rain, sleet or shine. Crossers and the rough stuff faithful should plump for the standard Gecko, though, since ingrained dirt, grime and even chocolate calls for more than a superficial cat lick. In technical terms, this is the same EVA found on the rubberised Gecko but coated with a velvety, hardwearing brushed cotton common to certain genres of smart street attire. Arundel say it's marginally thinner than the regular types but this wasn't obvious from the shock absorbency on dressing the bars. I've been fastidious in my cleansing of the elected drops, removing every last trace of tape, adhesive or other contaminant that might compromise the new wrap's purchase. However, the Arundel range seems to require a very tight, rhythmic mummifying technique to prevent unravelling as you enter the home straight. While a little frustrating in the garage at half-eight on a Monday evening, it's positively welcome should you need to change a control cable without the expense of replacing perfectly good tape. Sealing the tops with premium grade electrical tape makes all the difference and puts an end to slippage. Arundel say sweat beads and rolls from the nap, unlike the cork varieties that often allow moisture to permeate the pores. Moving the trainer to the kitchen with the thermostat pointing toward tropical induced plenty of perspiration that pooled on the surface, or to the floor. Taken to the road and the soft, grippy texture is reassuring in gloved or bare hands whether charging for the lights or braving a white knuckle descent in the pouring rain (and if anything, it becomes all the more dependable in this context). Some might find satin black unimaginative but it sure is practical. Credit where due, this tape stands up well to being leant against brickwork and similarly coarse surfaces without tearing or premature wear. Arundel say, "Gecko Fur is our inaccurate definition for a new style of bar tape made from cushy EVA foam and super soft moleskin feel top layer in a laminated, layered construction with a strip of adhesive on the back. Gecko Fur has a velvety feel and is 'grippy' wet or dry compared to cork and in the wet compared with Gecko Grip tape, it also has a warmer feeling than Gecko Grip. 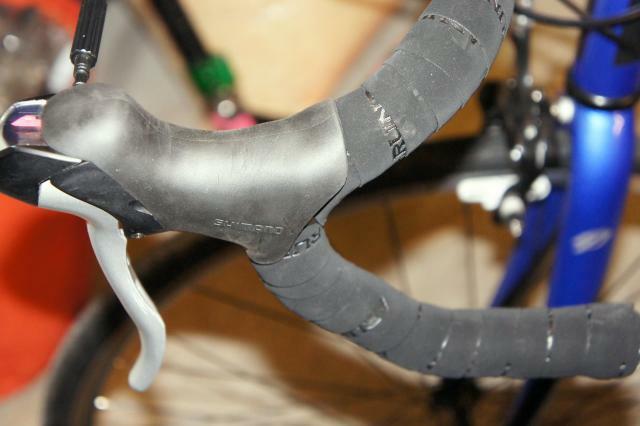 It lays flat on the wrapped bars and has a slightly thinner feel than our cork tape. It doesn't absorb sweat as easily as cork tape and can be wiped off with a wet rag in seconds." Sweat and rainfall certainly come off easily; purging mud spatters, chocolate and residual chain lube/grease isn't so straightforward. EVA foam backed for comfort. The Gecko Fur quickly won me over with its soft, yet grippy texture and protection from fatigue-inducing road shock. Surprisingly good for indoor training too. Ridding the nap of certain grime can prove tricky so it wouldn't be my first choice for 'cross. Tactile, grippy and surprisingly hardwearing. Trickier to keep clean compared with other textures. Would you recommend the product to a friend? For generic road and turbo trainer duties.